Most kids growing up in Franconia, N.H., like to ski in the winter, and Tyler Walker was no exception even though he’s been a double-amputee since the age of four. Tyler was born with a condition called lumbar sacral agenesis, meaning he has no lumbar vertebrae or sacrum. As a result, his legs didn’t develop properly, and his parents ultimately decided to have his legs amputated at the knee. “To make life easier, so I could get around more easily,” said Walker. Tyler’s dad went to great lengths to ensure that his son was skiing like the rest of the kids. First, it was a “sketchy” contraption he built his son out of a plastic sled, cross country skis and levers with metal spikes. A few years later, he bought Tyler a snowboard, put a plastic seat over it and had Tyler sit down while leaning over and dragging his hand on the snow. 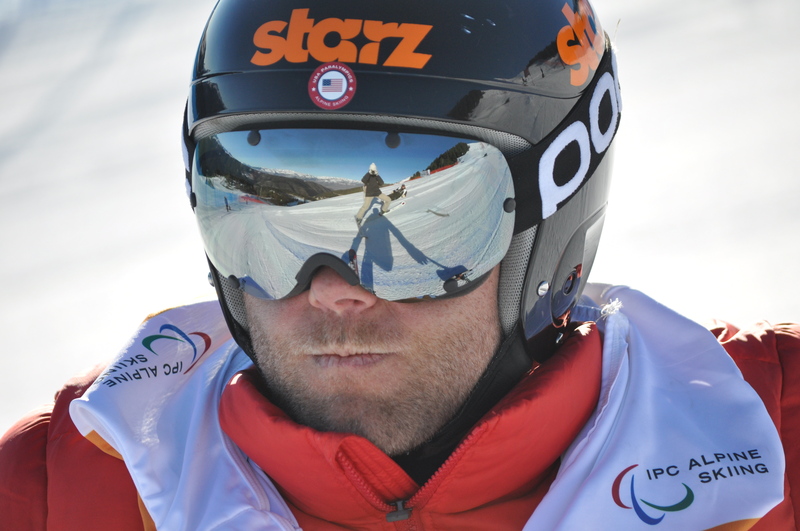 According to Walker, it’s so difficult to implement new advice or apply new techniques because with skiing, there’s not much time to think and the margin for error is incredibly slim. “In ski racing if you make a mistake, like if you’re a little bit too wide on the gate or you lose your edge briefly and you lose a couple tenths of a second, your day’s over; you’ve just lost the race,” explained Walker. For that reason, Walker has trained himself to be able to change his technique and “mental state” during and in between runs. 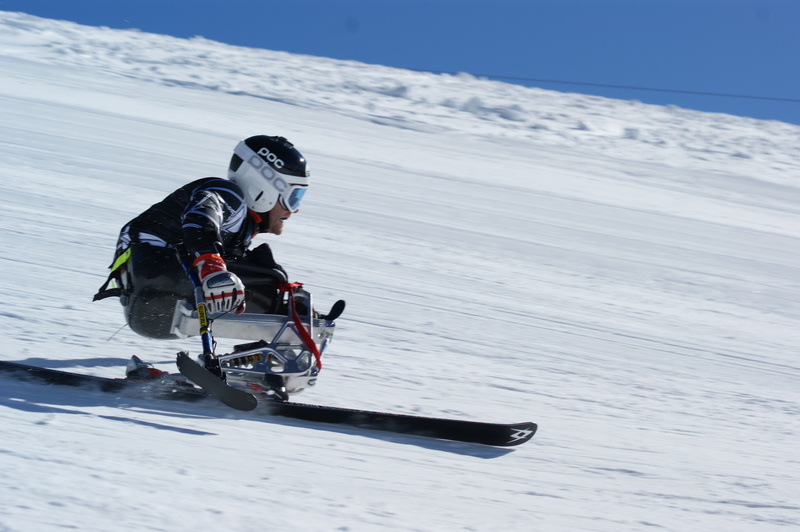 When Tyler was 8 years old, after years of building makeshift equipment, his family discovered Adaptive Ski Programs New Hampshire, which is catered to skiers with disabilities. Through these programs, he learned how to use a bi-ski and eventually graduated to a mono-ski by the time he was 12. Before he switched to the mono-ski, Tyler needed help getting around. The upgrade in equipment, however, made him much more independent, which was important for Tyler. The new equipment, which included a shock absorber, also allowed Tyler to take bigger jumps and go much faster. Since Walker switched to mono-skis, he’s gone through a number of different types. As the relatively new mono-ski technology (mono-skis have been around for only about 30 years) has improved, Walker and his coaches continue to be on the lookout for whatever will make him the best and fastest skier possible. “We figured out what frame geometries work best, what shocks work best (and) how to mount them in the frame,” detailed Walker. 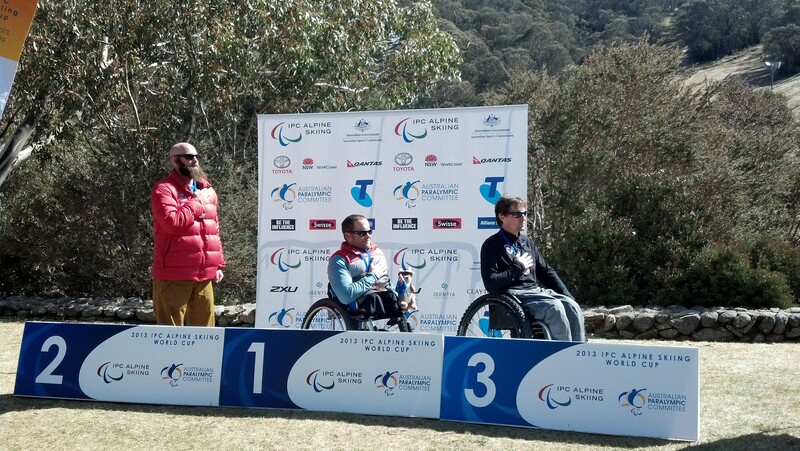 Despite (or maybe because of) the fact that none of the U.S. Paralympic Ski coaches have disabilities, the team’s system has worked extremely well. The adaptive skiers, who are sitting down on their mono-skis, aim to adopt the same techniques able-bodied individuals would use on two legs. Jardine has been teaching adaptive skiing for nearly two decades, while he’s coached Walker for almost half that period of time. But with Jardine, the fuzziness is greatly minimized because of Jardine’s years of coaching experience, as well as the two’s like-minded approach. 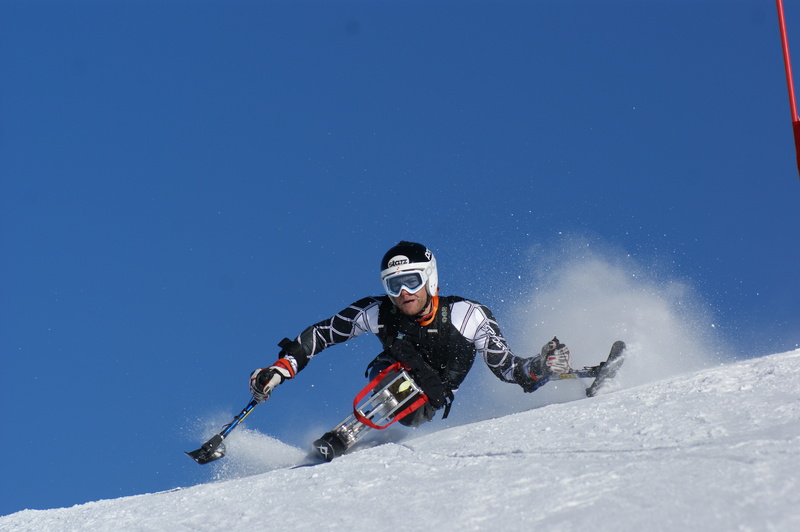 Even so, not everything a stand-up skier can execute is physically possible on a mono-ski. 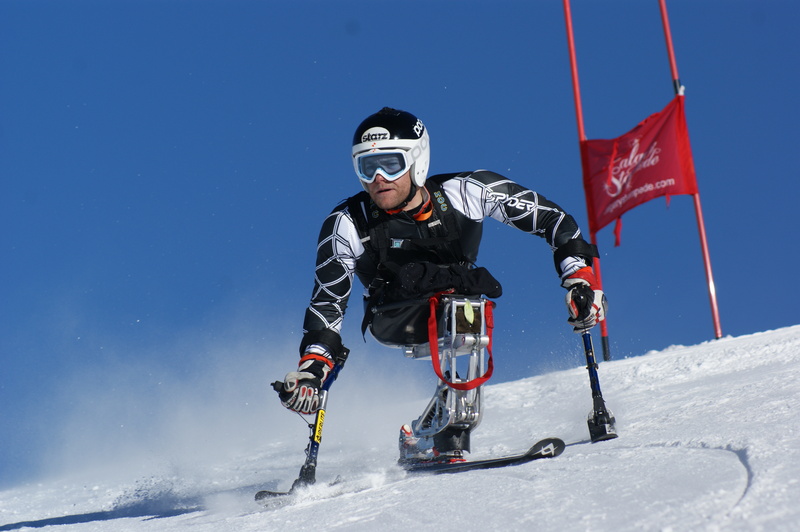 In skiing and ski racing, whether one has a disability or not, there is a considerable risk of injury. 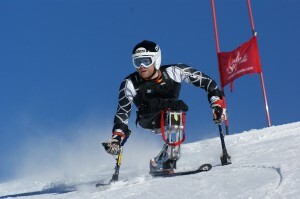 “We’re going freeway speeds without a safety belt, so a lot of interesting things can happen,” said Walker, who further noted that for adaptive skiers who are sitting down, knee injuries so commonly found in runners, football players and even stand-up skiers are replaced by injuries to the shoulder area. Injuries to the shoulder are most common because the shoulder is often the first body part to hit the snow in a crash. Such contact can result in a variety of injuries including torn rotator cuffs, separated shoulders and broken collarbones. Despite these risks, a sit-down skier is not a sitting duck. (S)he can be proactive in reducing such risks by working out and strengthening those muscles. With that in mind, Walker has access to the Olympic Training Center in Colorado Springs, Colo., where he and adaptive teammates must cater workouts to their ability level. Personally, he likes to do rotator cuff exercises. Walker considers himself lucky. While he often strains his shoulders from crashes or mere overuse, he has never incurred any really serious damage. Part of the reason for that may lie in his strong shoulders and arms. He’s always walking on them or using them to operate his wheelchair. Although the constant use of his arms and shoulders builds immense strength, there’s no getting around their overuse, as he can’t realistically stop using them. As a result, Walker suffers from chronic and nagging pains that aren’t much different from those any other elite athlete experiences. Developing the core is paramount to maintaining a race-ready body, according to Walker. “Upper body strength is good, but if you have a weak core you won’t be able to do anything,” he said. Walker likes to do different exercises on a yoga ball. For instance, he simulates turns on it. Without being strapped in by a seatbelt, his ability to balance is challenged, enabling him to build core muscle. It also replicates the motions that he goes through while making a turn. Being a Paralympian, as one might imagine, entails a grueling schedule. In fact, Walker has just one month off (May) all year. Walker isn’t skiing seven days a week year-round, but every day is dedicated to some aspect of skiing, whether it’s actual skiing, reviewing video footage, working on nutrition or fine-tuning strategy and the mental part of Walker’s game. Walker’s schedule between November and April is especially hectic, because he’s traveling virtually all the time. Tyler joined the national team when he was 18 years old. During his time at the University of New Hampshire, Walker found it especially challenging to balance school with training and competition. Since he finished school in ’08, “He’s really excelled at ski racing and his career’s kind of taken off because he’s had that as his only focus,” according to his coach. Walker’s passion for skiing and ski racing has resulted in various accolades over the years, making all the sacrifices well worth it. Walker is also a three-time X Games gold medalist, particularly excelling in the Mono-Skier X competition, which is essentially a race from the top of a mountain to the bottom with various rollers, jumps and gaps as obstacles. In addition to winning the event three times, he’s taken silver twice. Walker’s actions since he began skiing at four years old more than back up his words. As his coach can attest to, Walker has never been satisfied with merely skiing; his goals have always been much loftier. Jardine recalled an instance when he saw Walker crawling up Highlands Bowl (Aspen, Colo.), a hill that takes able-bodied Jardine 45 minutes to hike. Walker doesn’t yet know what he’ll do after Sochi, but judging from his lifelong ability to adapt to his circumstances, one would have to guess that he’ll figure it out pretty quickly. Ever the explorer, it’s doubtful Walker will get lost.